According to Matthew Kennedy's Edmund Goulding biography Edmund Goulding's Dark Victory, Jack Warner initially considered Errol Flynn for the role of the British music teacher. Goulding wanted either Robert Donat or Leslie Howard for the part, but eventually gave up on the British-ness of the music teacher and settled on by then two-time Best Actor Oscar nominee Charles Boyer. Joan Fontaine's role was initially supposed to have gone to Joan Leslie, but Goulding wasn't happy with that choice. Through then-husband Brian Aherne, who had played the music teacher in the 1934 version, Fontaine accidentally ran into Goulding while he was looking for a replacement for Leslie. Obviously not one to miss out on a good opportunity, Fontaine suggested herself as Leslie's replacement. Goulding went for it. Adapted by Kathryn Scola from Margaret Kennedy and Basil Dean's play, itself an adaptation of Kennedy's novel, The Constant Nymph also features Brenda Marshall, Joyce Reynolds, Peter Lorre, Charles Coburn, Dame May Whitty, Jean Muir, Montagu Love, Eduardo Ciannelli, Crawford Kent, and Marcel Dalio. Besides the Edmund Goulding-directed Joan Fontaine-Charles Boyer-Alexis Smith movie The Constant Nymph, other Library of Congress Film Archive entries on Turner Classic Movies tonight include Two Heads on a Pillow (1934), a B comedy directed by William Nigh, an important late silent era director (Lon Chaney's Mr. Wu, Ramon Novarro's Across to Singapore) later stuck with second-rate fare. Apparently a sort of Adam's Rib predecessor, Two Heads on a Pillow features former silent era leading man Neil Hamilton (Batman's Commissioner Gordon) and minor leading lady Miriam Jordan as once-married attorneys involved in a divorce case. It's probably worth watching even if only because of its cast, which also includes silent era veterans Betty Blythe (the title role in the now-lost The Queen of Sheba) and Claire McDowell (Ramon Novarro's leprosy-stricken mom in Ben-Hur, McDowell had been in films since the early 1900s). Not to mention the presence of Dowager Emeritus Mary Forbes. Another Library of Congress curiosity is the restored silent version of Lewis Milestone's Best Picture Academy Award winner All Quiet on the Western Front (1930), a heart-wrenching adaptation of Erich Maria Remarque's novel that in my humble opinion remains the greatest (anti-)war movie ever made. In fact, I find Milestone's early talkie (I've never watched the silent version) far superior to Stanley Kubrick's revered Paths of Glory; it also makes Steven Spielberg's Saving Private Ryan look like a grade-D war melo. In All Quiet on the Western Front, relative newcomer Lew Ayres stars as the young German soldier who quickly discovers that there's nothing glorious or heroic about World War I's death fields. In its talkie form, the film won two Academy Awards: Best Picture and Best Director. It was also nominated for Best Cinematography (Arthur Edeson) and Best Writing (George Abbott, Maxwell Anderson, Del Andrews). Michael Curtiz's British Agent (1934) is a disappointingly slow-moving spy melodrama starring Kay Francis and Leslie Howard. The spiffy Sparrows (1926), on the other hand, is one of Mary Pickford's best vehicles – what with the 34-year-old Pickford convincingly playing a teenage spitfire, Gustav von Seyffertitz as the heartless villain, dark swamps, ferocious alligators, and even an unbilled cameo by Jesus himself. The Library of Congress tribute continues throughout the night and much of the day tomorrow. Among the films being presented are Alfred E. Green's racy Baby Face (1933), considered so scandalous it was cut and reedited to make Barbara Stanwyck's go-getting gal more palatable to the bastions of Christian morality; Robert Siodmak's The Killers (1946), which marked Burt Lancaster's film debut (though this film noir actually belongs to Ava Gardner); Roy Del Ruth's machine-gun-paced Taxi! (1932), starring James Cagney and Loretta Young; and Edgar G. Ulmer's sci-fier The Man from Planet X (1951), featuring Robert Clarke and Virginia Field. TCM, The Constant Nymph presentation is an incredible gift to movie lovers. Perhaps next a presentation of the long-unavailable 1932 Joan Crawford movie Letty Lynton? Two Heads on a Pillow image: TCM. Kay Francis, Leslie Howard in British Agent. 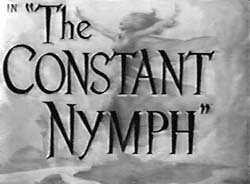 8:00 PM THE CONSTANT NYMPH (1943). A composer finds inspiration in his wife's romantic cousin. Dir. : Edmund Goulding. Cast: Charles Boyer, Joan Fontaine, Alexis Smith. Black and white. 112 min. 10:00 PM BABY FACE (1933). A beautiful schemer sleeps her way to the top of a banking empire. Dir. : Alfred E. Green. Cast: Barbara Stanwyck, George Brent, Donald Cook. Black and white. 76 min. 11:30 PM TWO HEADS ON A PILLOW (1934). Once-married attorneys face off during a heated divorce case. Dir. : William Nigh. Cast: Neil Hamilton, Miriam Jordan, Henry Armetta. Black and white. 68 min. 12:45 AM ALL QUIET ON THE WESTERN FRONT (1930). Young German soldiers try to adjust to the horrors of World War I. Dir. : Lewis Milestone. Cast: Lew Ayres, Louis Wolheim, John Wray. Black and white. 134 min. 3:15 AM : WILL ROGERS WINGING AROUND EUROPE (1927). Black and white. 0 min. 3:30 AM BRITISH AGENT (1934). An Englishman falls in love with a Russian spy. Dir. : Michael Curtiz. Cast: Leslie Howard, Kay Francis, William Gargan. Black and white. 81 min. 5:00 AM : WILL ROGERS EXPLORING ENGLAND (1927). Black and white. 0 min. 5:15 AM SPARROWS (1926). In this silent film, the oldest of a band of orphans watches over them while they are being used as slaves. Dir. : William Beaudine. Cast: Mary Pickford, Gustav von Seyffertitz, Roy Stewart. Black and white. 95 min. 7:00 AM : WILL ROGERS ROAMING THE EMERALD ISLE (1927). Black and white. 0 min. 7:15 AM ONE THIRD OF A NATION (1939). After rescuing a boy from a tenement fire wealthy young man learns he owns the run-down building. Dir. : Dudley Murphy. Cast: Sylvia Sidney, Leif Erikson, Myron Mormick. Black and white. 79 min. 8:45 AM : WILL ROGERS IN DUBLIN (1927). Black and white. 0 min. 9:00 AM THE MAN FROM PLANET X (1951). A space visitor uses hypnotic powers to enslave a Scottish island. Dir. : Edgar G. Ulmer. Cast: Robert Clarke, Margaret Field, Raymond Bond. Black and white. 71 min. 10:15 AM TOWED IN A HOLE (1932). Comic legends Laurel and Hardy decide to go into the fishing business for themselves. Trouble ensues when they must fix up dilapidated boat bought from a junk yard. Dir. : George Marshall. Cast: Stan Laurel, Oliver Hardy, George Marshall. Black and white. 21 min. 10:45 AM HEAT LIGHTNING (1934). A lady gas station attendant gets mixed up with escaped murderers. Dir. : Mervyn LeRoy. Cast: Aline MacMahon, Ann Dvorak, Preston Foster. Black and white. 64 min. 12:00 PM TAXI! (1932). A feisty independent cab driver fights off a crooked syndicate. Dir. : Roy Del Ruth. Cast: James Cagney, Loretta Young, George E. Stone. Black and white. 69 min. 1:15 PM THE KILLERS (1946). An insurance investigator uncovers a string of crimes when he tries to find a murdered boxer's beneficiary. Dir. : Robert Siodmak. Cast: Burt Lancaster, Ava Gardner, Edmond O'Brien. Black and white. 102 min. 3:00 PM JAMMIN' THE BLUES (1944). In this short, prominent jazz musicians of the 1940s get together for a rare filming of a jam session. Color. 10 min. 3:15 PM THE NAKED CITY (1948). A step-by-step look at a murder investigation on the streets of New York. Dir. : Jules Dassin. Cast: Barry Fitzgerald, Howard Duff, Dorothy Hart. Black and white. 96 min. 5:00 PM STREET SCENE (1931). A husband's violent reaction becomes the talk of the neighborhood when he catches his cheating wife in the act. Dir. : King Vidor. Cast: Sylvia Sidney, William Collier Jr., Estelle Taylor. Black and white. 79 min. 6:30 PM AMERICAN MADNESS (1932). A banker fights to keep his independence and protect his customers. Dir. : Frank Capra. Cast: Walter Huston, Pat O'Brien, Kay Johnson. Black and white. 76 min.